The picture is from website Savage Chickens, by Doug Savage. Please complete the cartoon. Do you have any idea in your mind now? If I tell you it is a Halloween contest: complete this cartoon and you could win Savage Chickens Stuff, will your answer be different? Using to analyze this material, here are some instances. First, we can see that the “from” is a cartoon. People in the linguistic community who understand what cartoon is, will know that the sentence you need to put into should be witty and comical. Second, the character is personified chickens so people might come up with some ideas related to chicken context, such as eggs, feathers and so on. Furthermore, the eye-catching part of the material is Frankenstein, which makes more sense to people who read Mary Shelley’s work or watch movies. These are some possible clues which enable us to understand the material. However, they are also constraints and limitations because the codes of this material make us think in these ways, instead of others. In the latter case, when I said the picture is for Halloween contest, a context is provided. People might think of everything which related to Halloween. Besides, a contest would also influence the purpose and outcome. In this regard, we have more similar expectations and assumptions to the results. They are open and free. Also, they are limited and constrained. It seems to me that HCI designers do things similar. They design products which could enable users to have their own meaning then use products in an individual way. However, designers also provide some codes which limit users to think and understand in certain way. These codes are tools of understanding and preventing misunderstanding. 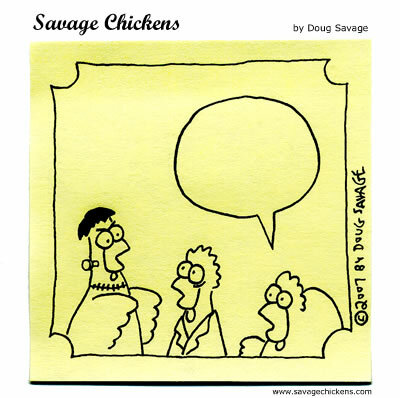 to take part in the Savage Chickens contest or view more cartoons, click here.